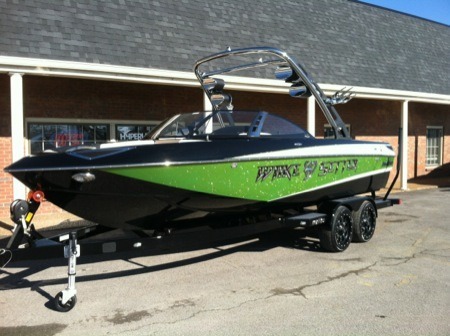 Has anybody seen a VLX or LSV with the new monster green? I have seen MXZ's but I am curious to see what it looks like on the other models. Ya I have, our local dealer has an lsv with it. I saw the monster grren on a VLX during a factory tour and it is a sweet color. You cant go wrong as the metal flake in the monster green looks really really good. I like it better as an accent color. Great looking color though. I will give Wizard Lake credit, they order some pretty cool color schemes, and ALL there boats are completely loaded to the hill.... Canada must be doing pretty good, all those boats are top of the retail price as well. My dealer said they are the #1 dealer in the world for Malibu right now, and there season is only 2.5 months long!
. An old bumper sticker from the 80s in Alberta sums it up.... Please lord give me another oil boom...I promise I won't piss it away this time. WLM also gets there for the quality of the dealership.... People with money is start. Yup, Wizard always has some sick color schemes. Alberta is the engine of the Canadian economy. Lots of oil money here. Lots of disposable income. Some peoples season is only 2.5 months. My season is usually 5 months. We start at the end of April when the ice clears, and ride till the end of September. My lake only gets up to 65 at the peak of summer, so you def need a drysuit for half the season. My dad has that bumper sticker at home. He worked his whole career in the oil business. Wizard is a great dealer for sure. I wont tell you about the 85 degree water here in the summer I can only imagine how cold the water is in April and May.... thats cool you get out when you do, to spend $100k+ on a boat and use it for 2.5 months would be a little tough for me. Haha. Ya, 85 would be sweet. Some of the lakes in the interior of BC get up to the high 70s. My lake is close to the continential divide, so its basically glacier water. The previous owner of my boat only used it 2 weeks a year. Spent the rest of the time in storage. My buddy has a 2011 247, and only uses it 2-3 weeks a year. Crazy if you ask me. Someone told me the Edmonton, alberta mastercraft dealership sells more boats than all of california. It doesnt surprise me. My lake has 4 newer mastercrafts and is about 3 square miles. Ya you are also riding on the coldest dam lake around! Lucky if Ghost hits 65! Just an hour north Gleniffer will get into the 70's... a little more comfortable! Someone told me the Edmonton, alberta mastercraft dealership sells more boats than all of california. It doesnt surprise me. My lake has 4 newer maastercrafts and is about 3 square miles. Have any of you considered moving to FL?? Not sure about that either, but I did hear that Martin is the largest volume MC dealer in the world, from their two Alberta locations. Also heard that Hyperactive is the number one Tige dealer in the world. I wouldn't be all that surprised if true. Ya, Ghost isn't warm, but it makes up for that in how clean it is. Is that the cargo Bimini? What does a Z5 run these days? Been a few years since I asked pricing. I've never seen a Z5 on the G3 tower. Is it even available? I'd love to see pics. Post 'em up!! Dealer quoted me around $4500, if I remember correctly.